The thing about families on television is that you watch them and you either think, my gosh I'm so glad this isn't my family, or you think, my gosh, this is my family. There's no middle ground, which is where The Middle comes in. You are either so greatful that you're family's nothing like theirs or... you know what? Actually all families are kind of like the Hecks in one way or another. So admit it, embrace it, get ready for The Middle Season 6 to premiere. What even happened last season? Naturally, the biggest story was the eldest Heck son going off to college. He packed up his favorite pairs of boxer shorts, and the family drove him off to East Indiana University, even though he wished none of them were coming along. Understandable. He had typical college woes, like trying to avoid his roommate, getting hazed as part of the football team (not cool, you guys), and also almost failing out of all his classes, and asking his little brother for help with them. Eventually, Axl drops three out of his four classes and has to figure out a way to tell his parents. In typical Axl fashion, he reasons that telling his grandparents first will be better, since they're older and will understand the life lessons he's learned by dropping them. But nope. They do not understand at all. They freak out just as much as his parents would and Axl heads back to school determined to figure out the whole college thing, and yes, he does enlist Brick to help him with a book report. Axl also bumps into his ex-girlfriend Cassidy and she leaves him an abstract painting in hopes that he'll know what it means, but Axl of course has no idea what it means. He just wants to know if he has a chance with Cassidy again. At some point or another, all moms go through a period where they feel completely neglected and unloved by their children. It's not usually the case, but considering everything else that goes on over the course of the day in any house, it's easy for moms' feelings to be misplaced. So when Frankie breaks down over her newly rescued dog Colin Firth, it's almost too much to take (no, I will not admit I cried during an episode of The Middle). The dog loves Frankie unconditionally, and in reminding her family of that, they all realize they could show Mom a little more love, too. This naturally makes it is utterly heartbreaking when Frankie gives Colin Firth to Dr. Goodwin (even though Colin is not really his dog), considering that Mike and CF had literally just finished bonding. It's time to add a permanent dog to the Hick household. That's something Mike could easily do on his quest to remind his life that he loves her (more on that later). Frankie also gets her self arrested at one point for an over-due library book, of all things. But she shakes the charges, and Brick gets to read the very-adult book Stormy Moon. The youngest Heck sibling enjoys such things as his iPad consonantal updating him with horrible news from all over the world, and it royally freaks him out. But thankfully, this leads Brick to realize that he should spend every moment with something he loves: books. There's also a point where Brick agonizes over a pretzel 1-800 line, and then fears the return phone call he might get, because he is woefully unprepared to further discuss any of his pretzel suggestions. Sue is like a flat circle. She is all of us, and she is none of us at the same time. Sue is our spirit animal, our patronous. Sue went from no prom dates, to five, to then no prom dates over the course of the day. Sue had kind of an up and down year. Her will-they-won't-they relationship with Darrin continued to go back and forth — he did get himself kicked out of the food court for her, since he wouldn't stop loitering. Sue thinks she makes the volleyball team, but it's only because the gym's floor caved in underneath her and the school doesn't want to be sued. She also realizes that college is a mere two years away, and she's going to need money to pay for it, and runs herself ragged trying to discover every scholarship she could be awarded, along with picking up extra shifts at her after school job at Spudsy's. Then, in hopes of trying to win a car in a contest, she ends up winning a trip to Disney World instead. It's like Sue has finally got a little bit of time in the sun. Know what retired television deus ex machina needs to come back? Going to Disney World. 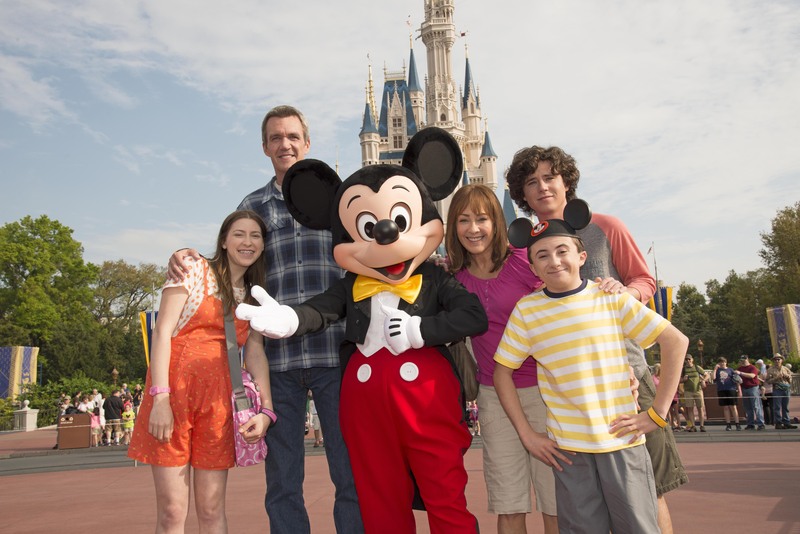 Remember how in the '90s every TV show went to Disney World at some point during its run? Those were the best episodes. Lately, no one goes to Disney World, but thankfully slowly these destination episodes are making a comeback. Sue passed out after seeing the Castle for the first time, and then ate a turkey leg too fast and scratched her esophagus. Brick spent an hour agonizing over what font to put on his Mickey Ears, and then lost his hat. Axl complained about everything, since all he wanted to do was ride a ride, you guys. Mike was the one who put all the kids in place, when it comes to light that the only reason he wants to take Frankie to EPCOT is that he knows he'll never have a chance to take her to any real foreign country. The two of them leave the kids behind and head off for a romantic dinner in the French Pavilion, and by episode's end the family's come together again to watch the fireworks.